David Hogg, who survived last week's mass shooting at a Florida high school, has become an outspoken voice in the national gun control debate. Now, he is responding to unsubstantiated allegations that he is an "actor." "I'm not an actor in any sense, way, shape or form," Hogg, 17, told CNN's Anderson Cooper on Tuesday. "I am the son of a former FBI agent, and that is true. But as such, it is also true that I ... go to Stoneman Douglas High School and I was a witness to this." "I'm not a crisis actor," he said. "I'm somebody that had to witness this and live through this, and I continue to have to do that." Tampa Bay Times' Washington bureau chief, Alex Leary, said Tuesday that an aide to a Florida state lawmaker sent him an email saying two kids in a picture "are not students here but actors that travel to various crisis when they happen." One of those pictured was Hogg. Leary and Tampa Bay Times' Kirby Wilson reported that the aide, Benjamin Kelly, was asked for backup to his allegation. He then sent another email, which had a link to a conspiracy video on YouTube. The video showed Hogg in California. Conspiracy theorists have asked what Hogg was doing in another state, and some have called him a "crisis actor," Leary and Wilson report. Kelly was apparently fired Tuesday by Rep. Shawn Harrison, R-Tampa. "Tonight Mr. Kelly was terminated from his position as my District Secretary," Harrison tweeted. "I am appalled at and strongly denounce his comments about the Parkland students. I am again sorry for any pain this has caused the grieving families of this tragedy." 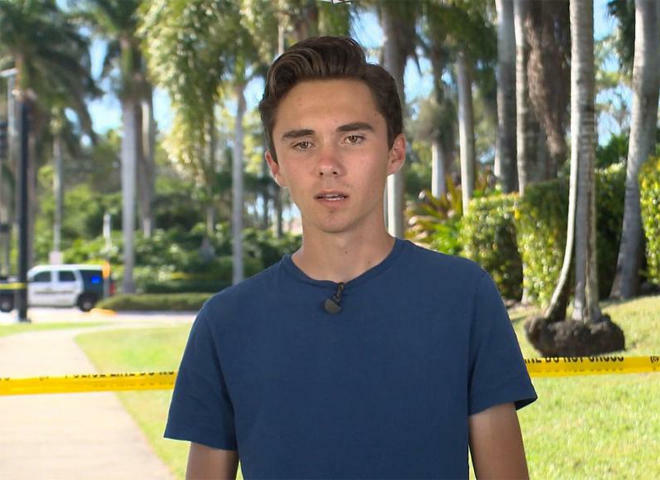 Hogg previously told CBS News he was in an environmental science class "when the first gunshot echoed through the hallways." "We never had an active shooter drill at my school, and though we did talk about what to do in this type of situation, nothing could have prepared us for this," he said. "Politicians and, more importantly, the American public must take action if we're going to prevent the next shooting," he said. Speaking to Anderson Cooper, Hogg said he is not against the Second Amendment. "I want every American to be able to own a gun that has a mentally stable mind -- a person that has a credible background, that doesn't have any previous like major convictions, and somebody that's not going to go out and commit these atrocities, because those are the people that are at fault here," he said.